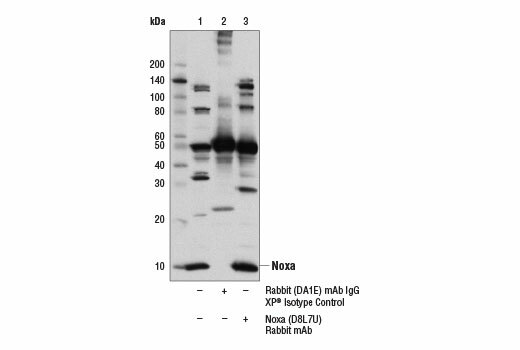 Noxa (D8L7U) Rabbit mAb recognizes endogenous levels of total Noxa protein. 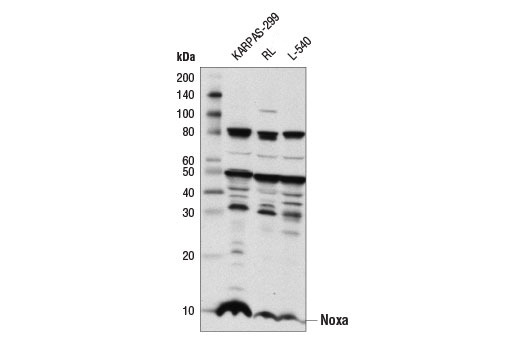 This antibody also cross-reacts with multiple unidentified proteins, most notably at 35, 50, and 80 kDa. Monoclonal antibody is produced by immunizing animals with a synthetic peptide corresponding to residues near the amino terminus of human Noxa protein. Phorbol-12-myristate-13-acetate-induced protein 1 (PMAIP1, Noxa) is a small protein that plays a key role in mediating apoptotic signaling. 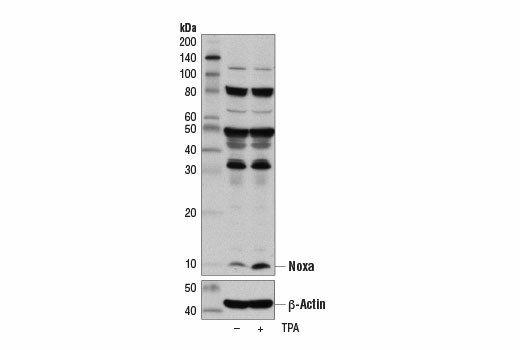 Noxa is a pro-apoptotic Bcl-2 family protein that contains a single Bcl-2 homology (BH3) domain (1). Members of the “BH3-only” family (e.g. Noxa, Bad, Bim, Puma, Bid, Bik, and Hrk) are highly regulated proteins that induce apoptosis through BH3-dependent interaction with anti-apoptotic Bcl-2 family proteins (2). Noxa localizes to mitochondria and binds the anti-apoptotic proteins Mcl-1 and A1/Bfl-1, but does not bind to Bcl-2 or Bcl-xL (3). 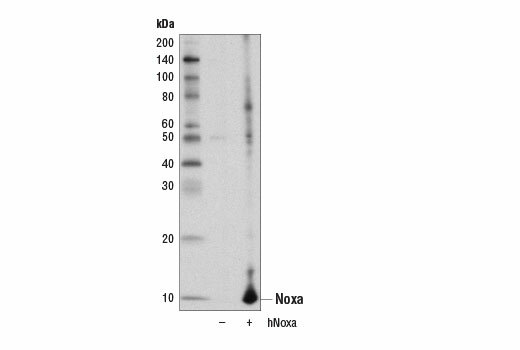 The Noxa protein competes with Mcl-1 for binding to mitochondrial Bak protein. Noxa was originally identified as a phorbol ester inducible protein that is highly expressed in adult T-cell leukemia cell lines (4). Several different stimuli, including DNA damage, hypoxia, interferon, viral infection, and double-stranded RNA, induce Noxa expression in cells. Higher levels of Noxa protein are typically found hematopoietic cells (3,5,6). Ploner, C. et al. (2008) Oncogene 27 Suppl 1, S84-92. Oda, E. et al. (2000) Science 288, 1053-8. Hijikata, M. et al. (1990) J Virol 64, 4632-9. Kim, J.Y. et al. (2004) J Exp Med 199, 113-24. Sun, Y. and Leaman, D.W. (2005) J Biol Chem 280, 15561-8.